Hey all, I decided last month to start a regular feature where I have a quick look into tennis tournament websites – what's good about them and what badly needs improving. I started the feature with a review of the Cincinnati Masters website and now it's time to review the US Open website. Grand Slams are the biggest tournaments of the year, so hopefully their websites are a class above the smaller tournaments and offer something far different so let's take a look! There's many a time when I've clicked onto a tennis website and instantly taken a dislike to it, mainly due to poor colour scheme or generally just a bad design but the US Open site is pretty impressive. I like the colours and I think they've done a good job of putting a lot of information on the homepage without making it look stupidly cluttered. When you have a website that has to deliver so much information then I think mega menus are a great way to aid the navigation and the US Open website does this really well. There's no guessing where I should click or doubts as to what I'll find if I do, everything is accurately split up so it's easy to find whatever I want. I think once the tournament starts and you're not actually visiting the venue then you're only ever after the following: Live Scores, Results, Highlights, Schedule, Press conferences/interviews and breaking news; these are all very very easy to find. 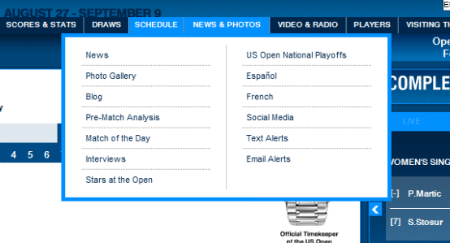 One of my main gripes about tennis websites is the shocking job they do of presenting the daily schedule – that's not the case here as the US Open again have got it covered. 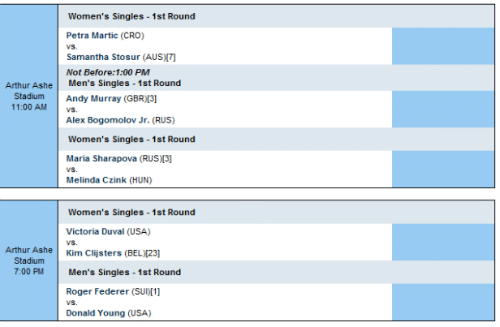 You get to see all the matches across every single court on one page – peRFect. A lot of tennis websites I've been on make you take an extra step and only let you see matches on a court by court basis on an individual page – annoying and difficult. The photo gallery is one of the best I've seen. Yet another winner here as the app functions very well and is easy to use. I'm using an iPhone 3GS which is pretty old now and the app works well with no bugs or closes so far unlike some of the other Slam apps I've used. The homescreen is very well set out and allows you to access all the key areas you'd need to whilst on the move or away from a computer. None, well almost! Maybe I'll update this section the more I use the site but as of yet I haven't found anything that I don't really like. The draws section is maybe a little annoying when it's broken into 4 but other than that there's no real issues. I kinda find the .pdf draw hard to read as the players are so closely grouped together I lose track of the line I was on but that's about it. Oh and I'd like the news section to be more than just articles on lines, maybe an excerpt would help break them up. I have to say I think the US Open website is pretty spot on, it works well, it's easy to navigate and has all the features I think a Grand slam website needs. I also like the way everything seems to be updated seamlessly and their social channels tie in very nicely with the website. It's not like each department is doing their own thing as they all seem to be in communication with one an other so there's no real gaps. What do you think? Are you as a fan enjoying using the US Open website? Does it lack anything? Let me know in the comments below. How Should Federer Approach Clay in 2019? What I really love about it is that the videos of the press conferences contain the whole thing. Not just a two minute excerpt of the player answering the most generic question, i.e. “Roger, how did last year’s US Open loss affect your game?” Zzzzz. Boring! I love watching all of it. Yeah very good point I forgot about that! Way better when you get the full clip, nothing worse than a shortened clip that only has a couple of questions in. Always cool to see Roger speaking French too don’t you think? Oui oui, c’est vraiment impressionnant! Yeah, although I just realised now the live scores has been very sluggish. Keeps getting stuck. 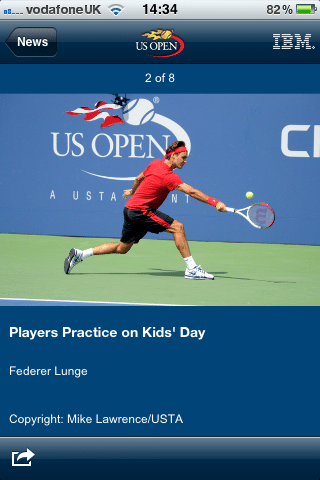 I just realize that the usopen website is very good after reading your post. Compare to other tennis websites, yes, it’s a lot better. Looking forward to your Roger’s 1st round US open post. Yeah it’s nice. Although now the tournament is underway I think the live score system is a little laggy. Keeps freezing. Hope they can sort it out. Nice website, but there seems to be something wrong with the footer in FF. Seems ok in Firefox for me, running 15.0 I think. What goes wrong with it? Now the tournament is underway I’m noticing bugs, scoreboard lags. The app crashes too!